results every time then Rug Doctor Pro is the solution for you. The Rug Doctor Pro is not only a carpet cleaning machine it can also clean mattresses and upholstery, plus there are a number of attachments, such as the Hard Floor Tool, which can be purchased to further extend the machines' capability. This is great because it allows cleaning companies to offer customers additional cleaning services. High performance and power. You can be confident that Rug Doctor Pro has the power to give professional results every time you use it. Reliable and durable. Rug Doctor Pro is the same in construction as the red Rug Doctor rental machine that withstands daily, often punishing use yet lasts for years. Rug Doctor Pro could be the last carpet-cleaning machine you'll ever need to buy. Specially formulated professional cleaning chemicals. Rug Doctor Pro cleaning chemicals offer a wide range of professional quality carpet and upholstery cleaning solutions to eliminate stains and odours. Time saving - the large tank means fewer refills. All Rug Doctor Pro carpet cleaning machines have the same professional cleaning power and method, but the Rug Doctor Pro Wide Track gets the job done faster - with 34% greater coverage per fill and fewer refills. Rug Doctor Pro machines make carpet cleaning easy and the Wide Track makes the job that much easier and quicker. Quality - tested and approved for superior cleaning. Proven commercial design, professional engineering and unique vibrating brushes deep-clean carpets down to where grit and allergens hide. Rug Doctor Pro offers great value for money. What's more, if you are not fully satisfied with your machine, every Rug Doctor Pro comes with a 30 day money back guarantee and a twelve month manufactures warranty. With Rug Doctor Pro you know you are buying a quality item as our machines have been tested and approved for superior cleaning. 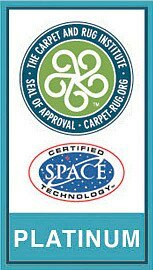 The Rug Doctor Mighty Pro is the only "wet extractor" machine designed for the consumer market that is approved for superior cleaning by the Carpet and Rug Institute (CRI) of America. Both the Mighty Pro and Wide Track machines are considered professional grade carpet cleaners. Our machines are built to last with vacuum power that far exceeds rival models. This is why Rug Doctor Pro has become the 'must have' cleaning solution in many cleaning businesses, hotels, restaurants, schools and contract carpet cleaning services around the world. Rug Doctor Pro adds value to a business. With proper care and maintenance the machine is designed to last a lifetime. The outside covering of the Rug Doctor Pro is made of a thick and durable plastic that can withstand hits and bumps without cracking, making it ideal for business needs. Our Rug Doctor Pro chemicals offer a number of solutions to common carpet spills and odours. This means that whatever the problem you are faced with Rug Doctor Pro will be the solution. business costs. This is something which you can reflect in your carpet and upholstery cleaning prices, making your prices even more competitive to customers! If you need a replacement part for your Rug Doctor Pro machine, please use the PDF below to help you find the name of the part and its product code.